1969, 8-track tapes and the new cassette format is all the rage, and for some reason, in the USA, Apple Records released this rather cheeky store display promoting the entire Beatles catalogue on 8 Track and Cassettes. 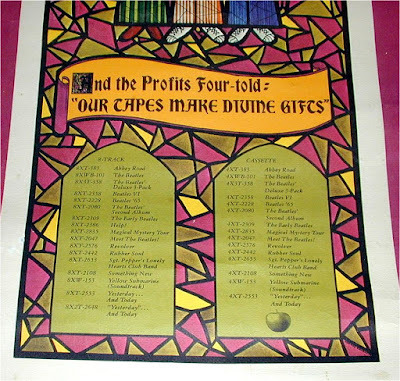 This 37" tall by 11.5" wide promotional poster features The Beatles in a stained glass window with the following verbiage: "And the Profits Four told: Our Tapes Make Divine Gifts". At the bottom of the poster is the complete Beatles catalog on 8 Track and Cassette Tapes. This poster was manufactured and released to record stores in late 1969: the very rare The Beatles Deluxe 3-Pack is listed at the bottom which was released in September 1969. It consisted of these three titles, "Meet The Beatles", "Yesterday And Today" and "Magical Mystery Tour". Legible close-up of the bottom of the poster. A printed cardboard held the cassette. SFX Cassette Magazine was a short-lived British music magazine published in the very early 1980s (not to be confused with SFX magazine, a best-selling science fiction magazine published continuously since 1995). 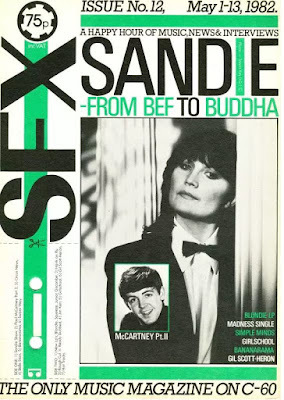 The distinguishing feature of SFX was its format: rather than traditional print media, the magazine was distributed in the form of a one-hour cassette. Magazines were sold as cassettes twist-tied to an 8-1/4" x 11-3/4" cardboard backing. The tag line of each issue: "The Only Music Magazine on C-60." The format of each issue was similar to a radio show, featuring news and interviews with pop stars (mostly but not exclusively British) and others involved with the music industry; reviews of record releases given by other musicians and artists; previews of upcoming album releases; unsigned band demo recordings; occasional features on culture, fashion and football (soccer); and three or four commercials per issue. 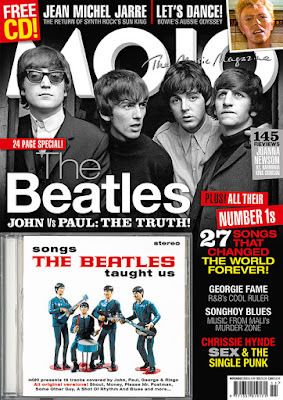 Part 2 of the McCartney interview was published in the next edition of the magazine. The concept was conceived and developed by Hugh Salmon, then a young account executive at Ogilvy & Mather, and edited by the respected NME journalist, Max Bell. 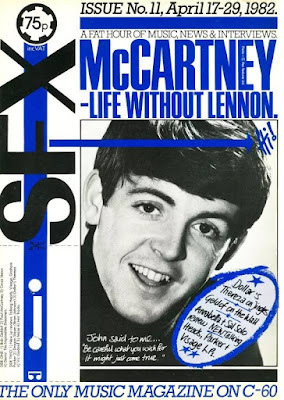 Among notable editorial coups, including Paul McCartney talking for the first time about his feelings of the murder of John Lennon, SFX provided the first opportunity for Jools Holland, keyboard player of Squeeze, and the young Paula Yates, a well-known figure on the music scene then going out with Bob Geldof. They both went on to present the TV programme The Tube. The publication was short lived, running from November 1981 through the summer of 1982. There were at least 19 known issues published. Taken as a whole, the SFX cassettes capture a narrow slice of music and pop culture as the punk/new wave movement was becoming more mainstream in content and performance. 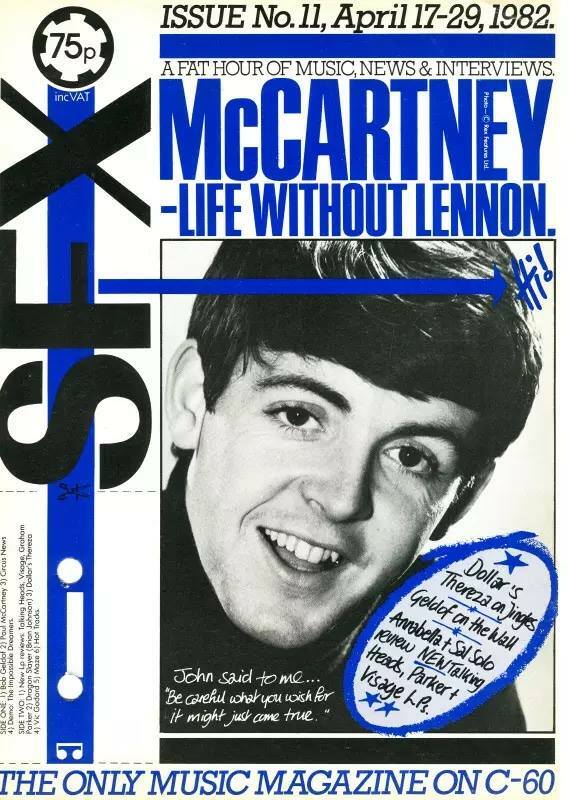 The McCartney interview, originally spread across two issues in April/May 1982, was one of the first times he had been interviewed at length since Lennon's death. In the interview he candidly discusses his relationships with The Beatles, Yoko and his feelings about and fame in general as well as the new "Tug of War" album, albeit briefly. It's a refreshing, genuinely insightful interview, free from his well-rehearsed 'stock answers' we get these days. Here then, is the interview with McCartney from these cassettes, courtesy of Parlogram. You can find all the editions of SFX cassette magazine here. Paul King, who recently directed the animated feature Paddington, is now in talks to tackle Warner Bros.’ animated musical "Meet The Beatles". This will be an animated family film, which will feature songs from The Beatles’ entire discography and will be shaped around the concept of the "one that got away," according to sources close to The Tracking Board. Producer will be David Heyman, via his Heyday Films, along with Jeffrey Clifford. Courtenay Valenti and Racheline Benveniste are overseeing for Warner. The script is by Jay Stern. The news broke just after the fiftieth anniversary of the first time we got to see The Beatles animated. The Beatles cartoons were screened in the US from September 25, 1965 to April 20, 1969 on ABC Television. It has been said that Neil Aspinall never cared much for the cartoon series in his day, and bought the rights as well as the production prints only to lock them away forever. Lately though, the Beatles' likenesses in the cartoon series have been licensed off by Apple Corps Ltd for use on commercial products. "My first meeting with Eirik was remarkable, and it took place during the late 60's. One day when John Lennon and I visited with Brian Wilson and The Beach Boys while they were recording, Brian and I ended up sharing the piano bench an playing our new songs, with John, Beach Boys, Van Dyke Parks and Eirik as an audience." - from Paul McCartney's introduction in the biography of Eirik "the Norwegian" Wangberg. 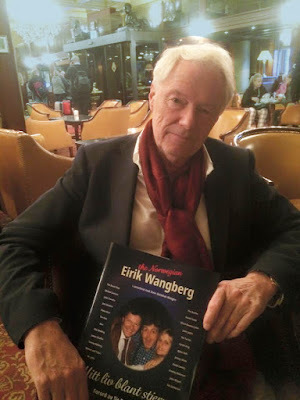 Friday we attended a press lunch to launch the biography of Eirik Wangberg, written with his collaborator Stein Slettebak Wangen. Eirik who? Perhaps you know him better as Eirik the Norwegian, which is the name he goes under on the cover of "Ram", where Eirik is listed as mixing engineer. This book is bound not to get the attention it truly deserves, because it is published in Norwegian. But it contains some fantastic stories from Wangberg's career, and a few are Beatles related. Eirik Wangberg was born in 1944 in England, but grew up in Oslo, Norway. He started out in the music business as the bass player for one of the earliest rock groups in Norway, "The Cool Cats", who recorded a demo in EMI studios in Abbey Road as early as in 1960, Eirik is only sixteen and it's two years before the Beatles arrive at the same studios. In 1964, Wangberg moved to California to study, but is soon captured by the recording industry, where he starts to work as a recording, mastering and mixing engineer and producer until he moves back to Norway in 1980. During his time in California, Wangberg is involved in the recording and or mixing of several well known recordings and hits, like stereo mixing records like The Turtles' "Happy Together", Scott McKenzie's "San Francisco (Be Sure To Wear Some Flowers In Your Hair)" and the soundtrack to "Monterey Pop". In 1967, Wangberg finds himself in Sound Recorders Studio in Hollywood, one of many studios Brian Wilson decided to utilise for the recording and mixing of The Beach Boys' upcoming album, "Smile". 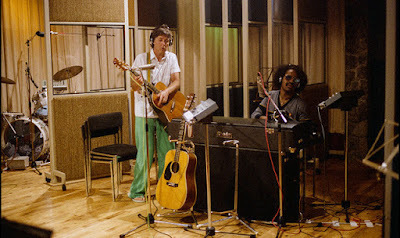 Having already recorded the song "Vegetables" with Wangberg first as second engineer and later on in control of the engineering, the Beach Boys, Van Dyke Parks and Wangberg are there to put the songs together to make a coherent album when John Lennon and Paul McCartney stop by, together with Derek Taylor. After having congratulated John and Paul on the success of their latest single, "Penny Lane" and "Strawberry Fields Forever", Wangberg plays back "Vegetables" for the guests from England. After having harvested compliments for the song, Wangberg, still not sure about who is who of John and Paul, witnesses an encounter where Paul and Brian are both sitting at the piano, playing each other's new songs. "Sgt. Pepper" is still not released, so Paul starts by playing and performing "Fixing A Hole". Brian counters by playing and singing "Heroes and villains", and Paul answers with "Lovely Rita". Wangberg can still rewind Paul's solo version in his mind, he writes. Brian performs "Surf's up", before the party breaks up, John and Paul leave and "Smile" is shelved indefinitely... until 2011! This visit by John and Paul is not documented in Beatles history. In April 1967, Paul spent a week in USA with his assistant, Mal Evans - not John. During his time in LA, Paul did visit Brian and The Beach Boys in their recording studio (April 10, 1967) without Mal, and the story goes that Paul partly co-produced "Vegetables" with Brian, chewing a bit of celery during the proceedings, and also played "She's Leaving Home" to Brian on the studio piano. It's tricky to work John Lennon into the story here, but Paul gives credence to the tale in his introduction to the book. I believe more research should ensue. 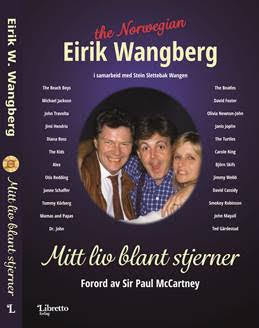 Wangberg's book: The photo on the front cover was taken before McCartney's concert in Drammenshallen in 1989. Another chapter in Wangberg's book is from 1968, when George Harrison is in town and shows up with the "White album" tapes. Unhappy with Capitol's mastering job, George wants it remastered by the studio where Wangberg is working. Wangberg's business partner Armin Steiner is busy mastering the double album anew, assisted by Carl Frisk. The upcoming single, "Hey Jude" and "Revolution" is also part of the package they perform their work on, and Wangberg sits in to listen, leaving Harrison waiting. This visit by George is somewhat documented. In the December 1968 issue of The Beatles Monthly Book, Mal Evans related how George was so upset by the cut he heard at Capitol that he took all day re-equalizing it so it sounded like it should. As detailed in page 270 of Bruce Spizer's book "The Beatles Swan Song " George Harrison did not approve of the original mastering job done by Capitol on "The White Album" As was often the practice at the time, Capitol's engineers had run the sound signal through a limiter and compressed the volume range of the recording by cutting back the high volume peaks and bringing up the low passages. Harrison insisted that the album be remastered. This took place under his supervision at Sound Recorders Studio on Yucca Street, which was located around the corner from the Capitol Tower. The book is jumping back and forth through Wangberg's exciting adventures and is a fun read. Anecdotes aplenty about celebrities like the Beach Boys, Paul McCartney, Diana Ross, Mamas & Papas, The Jackson Five, Olivia Newton-John and John Travolta and a host of renowned studio musicians. Of course, there's a huge section devoted to Paul and Linda McCartney's "Ram", the most important album of Wangberg's career. There are plans to have it translated into English. Wangberg is currently putting together a 2CD of music of his own, which he wrote and recorded during the sixties and seventies. 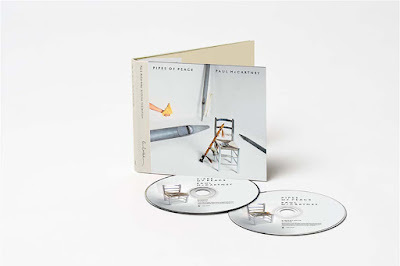 A sideways look at what's new on Tug of War/Pipes of Peace. Photo: MPL/Hear Music. Here is my review of the two new Archives Bonus CDs. I think anyone else can give their opinion on the remastered and “remixed” versions (the advance sampler comes with the ‘Remixed’ Tug of War only, not the ‘Remastered’), but there are no substantial difference with the past versions in my opinion, even the “remixed” Tug Of War which has LOUD vocals, and instruments and orchestras, but no alternate elements (like different vocals, extra instruments, etc), so I won’t go deeper on those. So, here my review, maybe you’ll find it helpful in some way. Speed corrected but the very same version as on bootlegs. Speed corrected but the intro is slightly edited (4 seconds). Complete on bootlegs. Speed corrected but the intro is slightly edited . Complete on bootlegs, where it is known as ‘Hear Me Lover’. Speed corrected but the intro is slightly edited (3 seconds). Complete on bootlegs. All 3, this is the first time they are out on an official CD. NEW 3 minute demo!! Unreleased song. Many changes in rhythm, I think one of Paul’s daughters sings the first part. NEW 3 minute 15 sec demo!! This is NOT the 1986 song. And not one of the best I’ve heard. Weird one that sounds like a John demo from the late 70’s!! NEW!! This was a surprise, it’s an alternate vocal take from start to finish! On this one, Michael takes the lead vocal first, instead of Paul (as on the official record) and continues thru all the song (MJ sings Paul’s parts and vice versa). The only “remix” I can hear is on the backing track, which does sounds like the released version, mixed. Glorious 7 minutes of alternate take! First time on official CD. A demo recording from 1984 on a compilation from 1980-83??. Still, the very SAME version as on bootlegs, and also, NOT “unreleased”, since it’s included on ‘Liverpool Oratorio’ under a different treatment. Sometimes called on boots “Christian Pop”. The DVDs contain the common video clips. The second version of the ‘Tug of War’ video has been in circulation among collectors since more than 10 years ago, still, very good that it’s finally official. This version is VERY similar BUT NOT the same as other unreleased Macca video: ‘Here Today’. It’s a mix of studio footage from the sessions, the mixing of the album, plus Paul doing some press interviews. 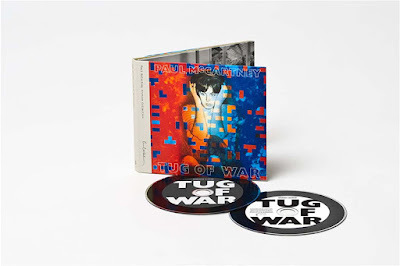 The unreleased version of ‘Tug of War’, contains Japanese journalists on the footage, for example, but the ‘Here Today’ video does not contains any of the press interviews but adds more studio footage, sadly ‘Here Today’ was not released on this Archive set. The “other” ‘Here Today’ video with a collage of John Lennon pics is FAKE, by the way, many fans think is real and it has appeared on many video compilations through the years, but is a FAKE ONE, a BIG ONE! The making of ‘Take it Away’ and home footage from Montserrat and AIR studios makes these boxes worth to get! I will go deeper on those later. 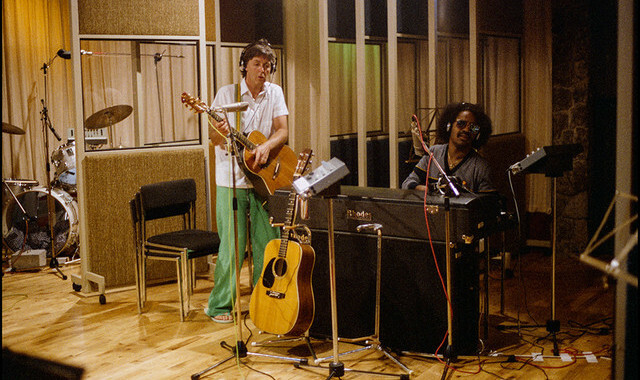 Paul McCartney and Stevie Wonder in the studio. Press photo. Paul McCartney continues to use Billboard in USA and NME in the UK as vehicles to promote the upcoming Archives editions by feeding them samples from the releases. This time, it's "Ebony & Ivory" which gets a Soundcloud preview, on Billboard here and on NME here. Billboard describes this remix of "Ebony & Ivory" like this: "additional vocals and a different mix that brings out the bass a bit more". 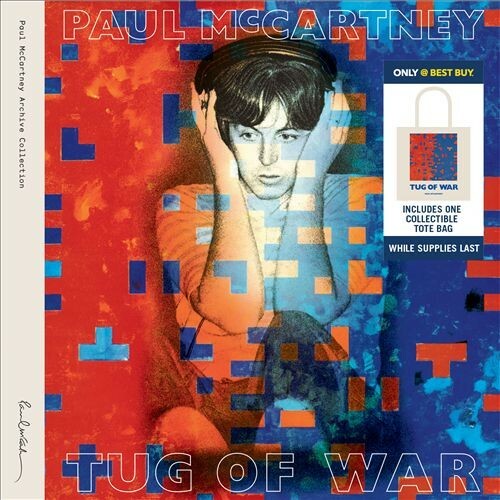 Meanwhile, Best Buy - the US chain stores are annnouncing special editions of the upcoming albums containing tote bags. The November issue of Mojo. The November issue of Mojo music magazine will be on newsstands in the UK from Tuesday 29 September. The issue features The Beatles on the cover, and the accompanying CD contains the original versions of 15 tracks covered by John, Paul, George and Ringo, including "Shout", "Money", "Please Mr. Postman" and more by the likes of Buddy Holly, Ray Charles, The Isley Brothers and The Marvelettes. THE BEATLES NUMBER 1s! As Apple unleash all 27 chart-toppers in an exciting new package, MOJO salutes the songs that changed the world forever, with a year-by-year examination of Fab Four chart-topping from 1963-1970, packed with feedback, freakitude and Na-Na-Na-Nas. PLUS! PAUL ON JOHN Inside the ultimate hit-making team! Macca unburdens to Paul Du Noyer in an exclusive extra from the MOJO writer’s new book. AND! FABS ON FILM The Beatles’ promo clips unpacked with their cinematic collaborator Michael Lindsay-Hogg. And no doubt, full page ads for the "Beatles 1" and "Beatles 1+" collections. Banner for Beatles 1+. Apple Corps Ltd.
"It was held in a special screening room in the basement of the Soho Hotel in London - just yards from Trident Studios, where Hey Jude was recorded. Unfortunately, none of the Beatles turned up, but there were many well known Beatles writers and DJs, including Mark Lewisohn, Philip Norman, and Paul Gambaccini." "As we went in, we were each given a copy of the very nice book, that will be included in the 'Beatles 1+' set. It is very nice, with details of how each song was recorded and also how the videos were made." "We were then given a talk by Jonathan Clyde from Apple, who told us about each video, and then shown the clips on a big screen. The quality of the videos is awesome, as is the audio. It's was interesting that Jonathan told us that Apple didn't have good quality copies of some of the videos, and that some came from an unnamed 'American Collector'. The stand-out video was definitely Strawberry Fields Forever, which looked like it had been shot yesterday. It is in totally amazing quality. Another highlight was Don't Let Me Down, taken from the infamous 'rooftop concert'. Also brilliant was Paperback Writer, filmed in the grounds of Chiswick House." "I'd seen nearly all the videos before (but not in such good quality). The only one shown to us which I don't think I had seen was Rain, from Abbey Road Studios." "During the event, I had a brief chat with people at Apple, who told me the Ron Howard 'Beatles Live Project' film is slated for release about this time next year. Mention was made of when we can expect 'Let it Be', 'Live at Shea Stadium' and 'Hollywood Bowl' to be released, but was told 'Apple work slowly' - so hopefully we will see these in our lifetimes!" Intertel promo for I Feel Fine. Photo: © Robert Whitaker. Not to be outdone by official product, Japanese bootleg company Misterclaudel is releasing their own promo set, quite a bit more comprehensive than "Beatles 1" and "Beatles 1+", the bootleg consists of 5 DVDs plus one CD. This list of contents has been distributed. I think you will agree with me that even though we may not purchase this bootleg, the list gives a good overview about which promo clips were released to promote the various projects through the years, and how many versions or edits were made. Of course, these promo clips were usually never issued to the commercial market, but to TV stations only. Please don't write to us to enquire about where to purchase the bootleg, we have no clue - this list was found posted in a forum. 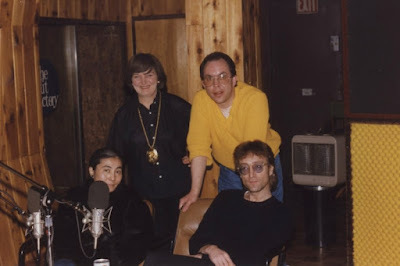 The above photo is probably familiar to you, as a similar one was used on the back of the soft cover book, "The Lennon Tapes", a transcription of the interview John and Yoko had with Andy Peebles from BBC Radio on 6 December, 1980. The people in the photo are Doreen Davies (Executive producer) and Andy Peebles, with John Lennon and Yoko Ono. This photo, along with other pictures taken on this occasion are now for sale through the auction house Nate D. Sanders, ending today, Thursday, September 24th, 5pm pacific. There are 33 total images on the negative strips, but only nine of them are of Lennon, and another one of just his wife, Yoko Ono. These photos are sold with copyright. Another item from the same auction is a silent colour film of the Beatles, identified as 25 August 1963 at ABC Theatre in Blackpool, England, filmed by fellow musician Chas McDevitt. At this concert, the footage shows The Beatles performing and there are also also backstage scenes, all in all lasting approximately 3 1/2 minutes. Shooting from the side curtain, McDevitt captures The Beatles performing on stage with John Lennon doing his ''spastic'' routine (recently a hot potato in the British press), though most of the film is of the Fab Four playfully mucking about backstage. It sees them reading fan letters, with John Lennon in particular being very animated, playing with musician Hank Marvin's glasses, and combing and styling his hair in a comical manner. George Harrison is shown playing his guitar and all four are seen talking to various people backstage. This film was earlier auctioned by Sotheby's back in 1999, and parts of it have been broadcast. In addition to the film spool itself, the lot includes two letters: one from Sotheby's, referencing the auction where this film originally sold (lot 399 in their Rock & Film Memorabilia sale on 15 September 1999), and referencing an enclosed letter where Chas McDevitt relinquishes copyright to the film. This letter is also included, where McDevitt indeed releases copyright to the new owner, who is the consignor of this lot and will transfer ownership to the winning bidder. The lot also includes an original concert program with the date of "Sunday, August 25th", corresponding to the year of 1963, listing both The Beatles and Chas McDevitt as performers. The Kodak film cartridge has handwritten labels that read, "Beatles Blackpool 1964 [sic]", "Beatles / on stage 4 in room", "Blackpool" and "Indoor Film / ASA.40". All the items are in very good condition, with the film spool in particular intact and well preserved. Perhaps this will be interesting to the people currently working on The Beatles Live Project? - The Beatles 1966 ''Battle of the Giants'' award given to them by the well-known Luxembourg radio show of the same name in 1966. Originally lot 62 in Christie's 26 May 1994 sale in London. - A signed programme from 1962, featuring the autographs of John, Paul and George. Missing Ringo's. - A signed John Lennon "Bag One" print. - Three album covers signed by all four, "Please Please Me", "Meet The Beatles" (both 15,000 — 20,000 GBP each) and "Beatles For Sale" (just 4,000 — 6,000 GBP). From BBC Radio 2: On 8th December 1980, one of the greatest songwriters of the 20th century was shot dead in New York City. 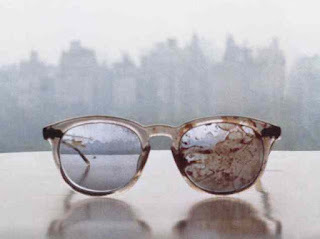 This single voice, dramatic monologue sits between drama and documentary and is an utterly compelling story of John Lennon’s last day. The Beatles star would have turned 75 on 9th October 2015, but his life was cut tragically short. This docu-drama, written by Stephen Kennedy, charts the events of that infamous day. The story is told by Liverpool actor Ian Hart (Boardwalk Empire, Harry Potter as Professor Quirinus Quirrell), who has played Lennon on three separate occasions. He guides listeners through the events of that fateful day in forensic detail and his narration is combined with the voice of Lennon himself – both from archive recordings and from the music that made him a legend. Ian Hart says: "There will always be interest and intrigue into every part of his life, and now we take a sensitive look at the incomprehensible day when he was tragically taken from this world too soon." Stephen Kennedy says: "I’m delighted to have my first radio drama commissioned by BBC Radio 2 and ecstatic to have Ian Hart performing in it. In my opinion, no actor has ever captured John Lennon’s character better than Ian did in the film Backbeat. He has extraordinary talent." The radio play will be transmitten on Thursday October 8, between 10.00pm-11.00pm. It's likely to be available for a month following that, through the BBC iPlayer. Stephen Kennedy is also director of the Dublin Beatles Festival. Even though we at WogBlog are very supportive of everything that promotes or portrays The Beatles and the individual Beatles in media, we are not altogether happy with all those documentaries which focus on that fateful day in Beatles history. 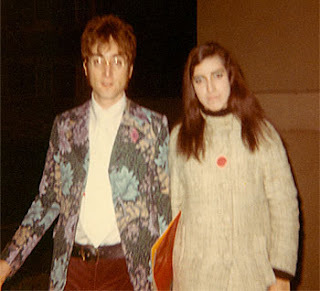 The senseless murder of John Lennon was a very traumatic time for those of us who were Beatles fans at the time, and one can only imagine how hard it was for those who were close to Lennon. 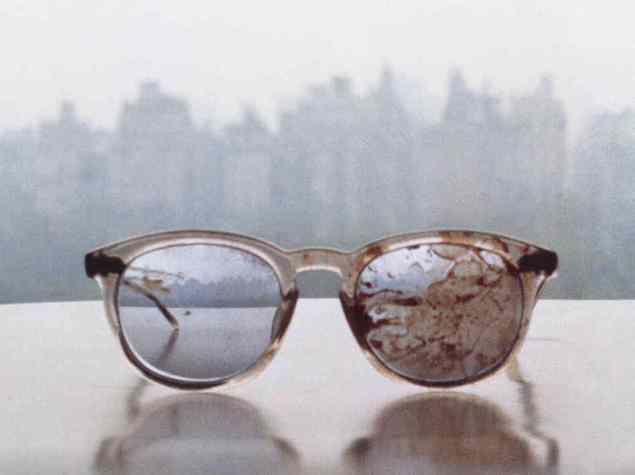 We could have done with a more uplifting way of celebrating 75 years since the birth of John Lennon. Lizzie Bravo with her book. 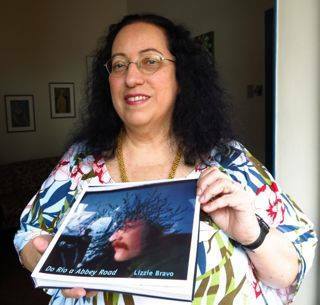 Lizzie Bravo's book about the Beatles "Do Rio A Abbey Road" will be released at the end of November. So far, it's the Portuguese language edition which is being released, the English language book will be available early next year. It's 300 pages, with 210 unpublished photos of the Beatles, most of the photos are of her favourite, John, then Paul, George and Ringo. Hardcover, 23x23cm, matte coated paper, photos and and/or illustrations are on most of the pages. Lizzie will handle the sale, packaging and shipment herself, and can be contacted by e-mail (write to lizzie.bravo@gmail.com and receive more information about payment and shipping). This is Lizzie with har favourite Beatle, John Lennon. This is an important document because it is a great collection of photos of the Beatles, in the majority unpublished, shot by herself, and she is a historical figure in Beatlemania. You'll remember Lizzie as one of the backing singers on the original version of "Across The Universe". When she was a teenager, Lizzie Bravo used to stand outside Abbey Road studios every day, hoping to catch a glimpse of the Beatles. She moved from Rio de Janeiro to London in 1967, when she was actually on a summer holiday, sponsored by her parents for her 15th birthday, but she decided to stay and eventually found a job as an au pair to support herself. Between shifts, she hung around the entrance to the famous building on the off chance that John, Paul, Ringo or George would drop by. On 4 February 1968 she was outside the studio as usual, when Paul came outside and asked if any of them could hold a high note,. Lizzie raised her arm, as she was a soprano at her school choir back in Rio de Janeiro. After that, Lizzie and fellow Fab Four fan Gayleen Pease were escorted to Abbey Road's Studio Two, where the Beatles were busy recording "Across The Universe". Paul and John started to give the girls instructions about the part they needed them to sing. She was sharing the same microphone as Paul and John. According to Lizzie, the session lasted for "about two hours". She then returned to her "vigil" outside the studio, while Gayleen Pease went home. Lizzie's adventures in London ended in October 1969. She was homesick, but she had also noticed that the camaraderie she had seen during the "Across the Universe" sessions seemed to have faded. "The Beatles weren't coming to the studio every day and most of the time they wouldn't even be there together. It was time to move on." Always a champion of The Beatles in Brazil and on the internet, Lizzie remains a Beatles fan. 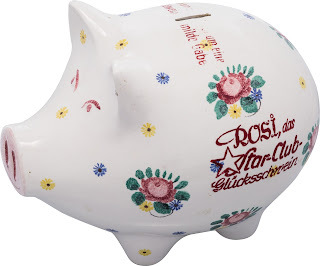 "Rosi", the tip jar. Photo: Heritage Auctions. Here are some of the results from Heritage Auctions' sale of the Uwe Blaschke collection, as we reported about in an earlier blog post. A full set of psychedelic Beatles portrait posters by Richard Avedon for Stern magazine also went for $4,000, as did a mono US sealed copy of the Sgt Pepper-album (MAS 2563). A sealed US "Let It Be" album from 1970 sold for $3,000. A pristine copy of a pasteover second-state "Butcher Cover" with the original shrinkwrap and price tag went for $1,875. You can find more auction results here. 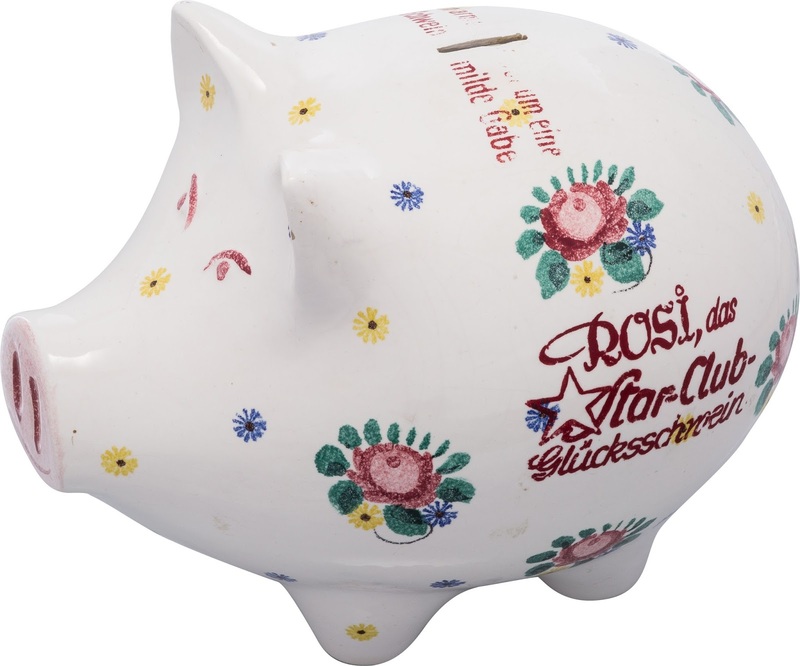 114 items failed to reach the minimum bids, including "Rosi", the Star Club piggy bank tip jar. Inlay card from preview boxed sets. The inlay card in review boxed sets for the upcoming new Paul McCartney's Archive Collection series releases, "Tug of War" and "Pipes of Peace" was, for both boxes this one. 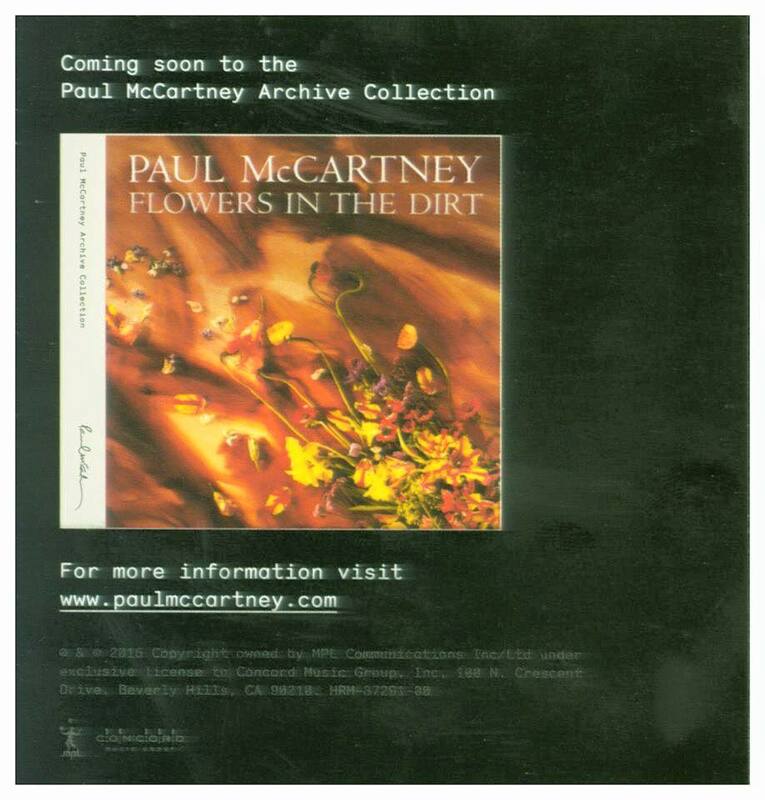 So, "Flowers in the Dirt" will be out on it's own, and not released simultaneously with another one from the series. Which prompts the question, will this be the final release in the series? It's likely the release will be scheduled for next year, 2016 and the series was going to end that year, according to the original plan. 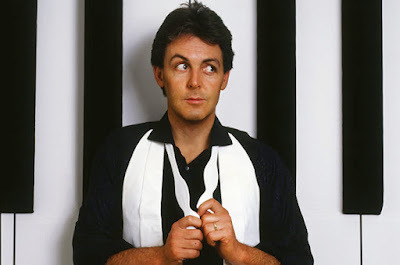 Standalone releases have been "Band On The Run", "Ram" and "Wings Over America", the ones that came in pairs were "McCartney" with "McCartney II", and "Wings: Venus and Mars" with "Wings: At The Speed of Sound". In a recent interview with BBC's Radio 2 on Saturday (currently available here), Paul talked about Wings: "Wings were getting a bad rap at that time [the Seventies] because it was post-Beatles, and anything you did or I did that was solo was stood up against The Beatles. So you tend to go along with that, and I went along with a bit of that thinking 'well it's never gonna be that good but I'll do it because I love doing it'." "And then you listen to it back and think 'this is better than I thought it was'. So that's great to do, to really listen back and think 'I'm glad I did that, glad I kept going', because you know if I listened to the critics I might have given up." Then what happened to the Wings albums "Wild Life", "Red Rose Speedway", "London Town" and "Back To The Egg"? It's this writer's hope that the series will continue so that expanded versions of these albums will get the treatment they deserve. "Wild Life" ought to include the film from the ICA rehearsals prior to the 1972 tour, "Red Rose" should be expanded to the double album it was originally conceived as and the DVD should include the "James Paul McCartney" TV special, and "Back To The Egg" could include a live Wings concert from their last ever tour, as well as a DVD with the "Back To The Egg" TV Special. We also have a soft spot for "Press To Play". There, I said it. November 25, 1965: The Beatles recorded ten music videos, 8 of which are due on Beatles 1+. In October, I am going to be part of a panel discussion at the Norwegian Beatles Festival. The discussion will have the subject "What will the status of the Beatles be 20 years from now?" Over the decades since The Beatles ceased to be, we have had some resurgence of the band's popularity, which have won them new fans in younger generations. Myself, I'm a one and a half generationer, having been alive during the Beatles' career as a touring band and actively recording and releasing records. However, since I was just a young child and didn't get into music until the seventies, I'm no first generationer. The first time The Beatles experienced a revival was in 1973 with the release of the red and blue album collections. This wave of success continued with the release of the singles collections in Britain and elsewhere, in 1976 new fans were recruited by the "Rock and Roll Music" 2LP and culminating with the 1977 release of "The Beatles at the Hollywood Bowl" live album. Further collections released by EMI/Capitol went by rather unnoticed by the general public. 1981 was another big Beatles year, because of the revived sales figures of Beatles albums spurred by the tragic death of John Lennon. 1982 saw the "twenty years ago today" wave of U.K. Beatles singles, repackaged, but these records were mainly purchased by people who were already fans. In 1987, The Beatles' records finally came to the CD medium, which fuelled another wave of recruitment. Not much happened for the rest of the decade, and the nineties came along. 1993 saw the first release of the red and blue albums on CD. This wouldn't have accounted for much, but Apple Corps released a bunch of music videos to television stations in order to promote the collections. Exposure on TV was free, care of the new music TV channels spearheaded by MTV, and this again lead to new generations discovering the Beatles. Free of the old contract with EMI and lawsuits to get a better deal, "The Beatles Live at the BBC " was released in 1995 and became an instant hit, this lead to a revival kept alive for the next couple of years by the release of the Anthology TV series and albums. The rest of the decade was relatively quiet, the 1999 release of a restored "Yellow Submarine" film with accompanying album featuring remixed songs from the film and an accompanying brand new "Hey Bulldog" music video didn't make much of a dent in music history. It was for people who were hooked already. 2000 started the new millennium with a bang, though - that year's "Beatles 1" single disc compilation of The Beatles' biggest hits was a phenomenal success. The album wasn't just 2000's best selling album, it went on to become the bestseller of the 2000-2009 decade and won over new generations. But since then, we've seen a lot of releases which haven't lived up to the success of that album, even though they have offered new, unreleased material, like the 2007 "Love " mashup album and the "On Air" new compilation of radio performances, not to mention the iTunes only "Bootleg recordings 1963" release. As for video, new and enhanced versions of films which had been out on video cassettes have cropped up on DVD and Blu-ray discs, with much hoo-haw among Beatles fans, but not so much in the eye of the general public. In Norway, a band who call themselves "The Beatles Project" are touring with a show comprising all the Beatles songs over a period of seven years. In 2013 it was the 1963 songs, in 2014 the 1964 songs and last week-end saw the debut of their 1965 show. The show has been a huge success, gaining favourable reviews everywhere they have played, and filling concert halls. I've been to a few of their performances, and I can report that the main part of their audiences are not young people, but there are a lot of first generationers there. This in contrast to the Paul McCartney concert I went to in July, where there were more younger fans. 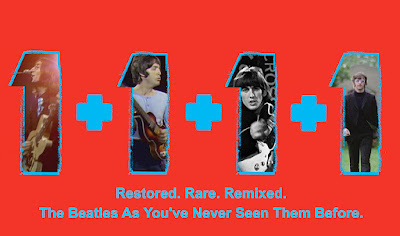 Will the new releases of "Beatles 1" and "Beatles 1+" generate a new audience for the Beatles? It is a long-awaited release for us veterans, both for the visually oriented (the music videos) and the audio oriented (new stereo mixes, surround sound for the first time on several tracks) ones. But will the plethora of previously rare music videos, commercials and media reports recruit a new generation of fans? I doubt it. The era of music television is over, and MTV is split up in several channels specialising in the various new music genres. TV on demand is the new way of watching, which makes people select the type of entertainment they are already used to, and people don't experiment much. No doubt, some new fans will be recruited among the young generation, but they won't be the coolest kids in school. All three "Hello Goodbye" Saville Theatre videos are included. This is from Video #1. One of the most eagerly awaited Beatles products is about to hit the market. For Beatles video collectors, the release of a collection of the music videos was on the top 3 most wanted list, alongside the "Let It Be"-movie and "The Beatles at Shea Stadium" TV-film. Yesterday, I first published a list of the releases as prematurely revealed by Amazon, and then waited for the official announcement, which was expected at 2pm UK time, 3pm my time here in Norway. When the time was up, and the information went public, I just pasted the contents of the press release over my previous blog post, and then left it. 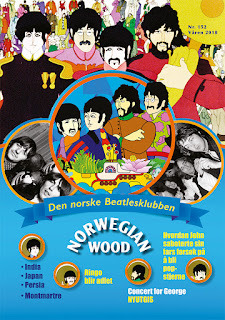 The next hour I spent translating the text to Norwegian for an identical blog post on the site of Norwegian Wood, the Beatles fan club, and when that was finished I had to go, because Tuesdays I go pub-quizzing. Today, when I again had access to my computer, I was amazed to find that yesterday's WogBlog post had raked up the most traffic this blog has ever seen. More that 10,000 views in a single 24-hour session is fabulous by my standards. After The Beatles' "Anthology" TV series, then head of Apple Corps Ltd, Neil Aspinall was asked what was up next, perhaps a video collection of The Beatles' promotional films? His reply was that it was "too obvious". Well, we're certainly glad things have changed with the new management. Back in December 2013, when it was first revealed that a "1"-themed Beatles video collection was in the works, planned for release in October 2014, I wrote a blog post about it, and forwarded my suggestions about what the collection should look like. Let's compare what I wrote with what came out of it. In December 2013, I wrote: "One important decision to make is whether or not to make it a 16:9 (widescreen) or a 4:3 (old TV) collection. Back when McCartney released his own music video collection, "McCartney Years", the director had chosen to make it 16:9 despite all the original music videos having been made in the 4:3 aspect ratio. So he chopped off tops and bottoms to make this happen, and there was an outcry among the fans about this. We don't want that to happen again. But if they decide to go for this, the general public will want widescreen, please do all the necessary restoration work in the original 4:3 aspect ratio format and save it for history. When everything is done and ready, you can do the conversion to 16:9 and release that - perhaps with an option for the concerned core fans to purchase a limited edition 4:3 version of the DVD/Blu-ray or as a download". Judging by the samles they have offered in the promotional material for the new release, it does indeed look as if they have listened to my suggestions, as the videos seem to have kept their 4:3 aspect ratios. In December 2013, I wrote: "As for sound, the ones that don't have a unique audio mix should be synched to the remastered stereo sound from the albums, "Hey Jude" and "Revolution" should use the original soundtrack that was partly performed live as it happened. And hire Giles Martin to produce a 5.1 surround sound optional audio track. And use me as a consultant for the project". Well on this matter, they have bested me for sure. I never thought they'd give it a completely new stereo mix. I thought that idea went out of the window after the 1999 "Yellow Submarine Songtrack" album. Now that remixing is again back in fashion, perhaps we'll see the whole catalogue revamped in modern stereo? They did hire Giles Martin, and he did produce a 5.1. surround sound mix. They never got around to hire me as a consultant, but then again they did get my advice for free through the blog post. I wrote: "EMI did make a video for this song back in 1982, and I think two different versions of it is circulating. Since this has been the official Love Me Do video for three decades now, it's best to use it again. It may need to be recompiled, using the same footage in upgraded quality". Here's their description: Newly edited clip, featuring material from BBC TV’s "The Mersey Sound", with performance footage filmed on 27 August 1963 at the Little Theatre, Southport. As the two videos I wrote about also were based on the mimed footage from the Little Theatre in Southport, they somehow used a bit of my idea. And the bit about recompiling the video with the same footage in upgraded quality was also used for their recreations of the "Get Back" and "Let It Be" promos. I wrote: "There are no music videos or promotional films, as they said in the sixties, for these two. So they will probably make a couple, using performance clips or mimed TV appearances. Big Night Out/Ready Steady Go?" They went for performance clips. For "From Me To You", they used a live performance at the 1963 "Royal Variety Show", filmed at The Prince Of Wales Theatre, London, on 4 November 1963. For "She Loves You", they used a live performance from the Swedish Television show "Drop In", recorded on 30 October 1963 during a short tour of Sweden. I wrote: "Again, the same sítuation (no known promo film exists), but the TV clip from "Late Scene Extra" of the Beatles miming to this song in front of a huge model of a camera has been regarded as the music video for this song among fans for a long time, so they should use that". And they did. Description: From the Granada TV programme "Late Scene Extra" filmed on 25 November 1963. For these two films, I suggested: "They could have used footage from the A Hard Day's Night film for these, but that footage is now owned by Miramax and has to be licensed from them. Another option is to use performance footage and synch it to the records, for instance from the Shea Stadium film etc. Ready Steady Go for "Can't Buy Me Love"?" As they seemed to have come to an agreement regarding the "A Hard Day's Night" film, and were involved in remixing the sound for the 2014 release, I suppose they could have used it now. But they didn't. 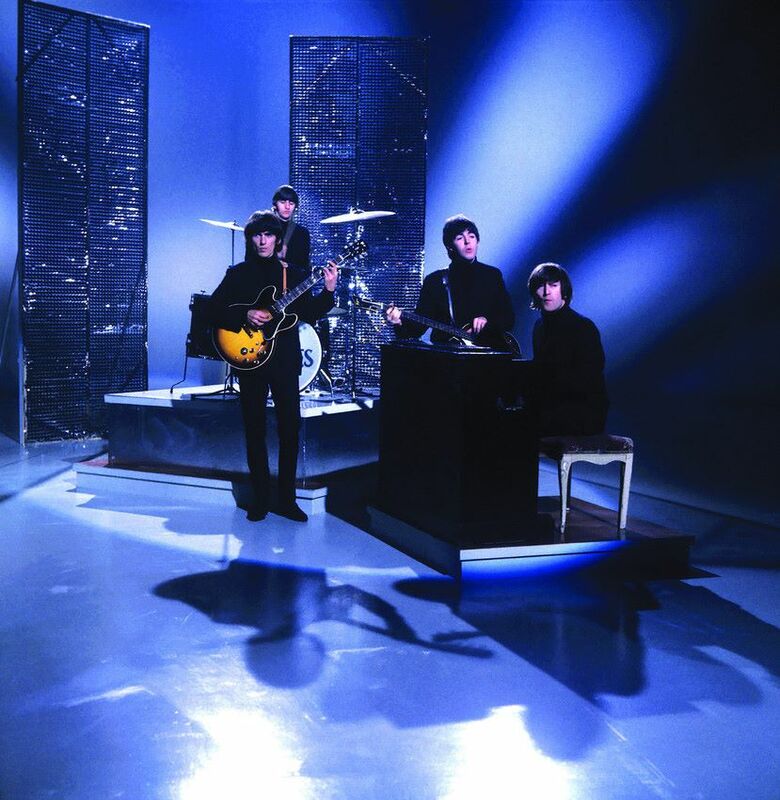 For "Can't Buy Me Love", they used a mimed performance from the TV show "Around The Beatles", filmed on 28 April 1964 and broadcast the following month. For this show, the Beatles re-recorded the songs and mimed to these new recordings. 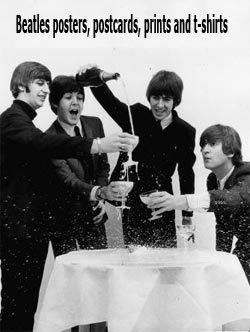 For "A Hard Day's Night", like earlier for the "From Me To You" and the "She Loves You" films, they turned to a live performance. The film they used came from a live performance at the Palais des Sports, Paris on 20 June 1965, while on a short European tour. I wrote: "We are now entering the realm of the Intertel promo films, as produced by Tony Bramwell and directed by Joe McGrath. Tuesday November 25th, 1965, the Beatles filmed ten different promotional clips in black and white for five songs, "Help!," "We Can Work It Out" (three versions), "Day Tripper" (three versions)," "Ticket To Ride" and "I Feel Fine" (two versions). So for this and some of the following clips, the producer of the new video collection has the luxury of choosing between several films. And I do think that the Intertel videos should be used, because they have been regarded as the music videos of these songs since the sixties. In Anthology, they would put several of these together to create variety, but in my opinion they should select one video of each to represent each song. If they want to include more than one, the alternative version(s) should be presented as bonus material on the DVD". Which is very much what they did. Of the ten Intertel films from Twickenham videotaped that day, they have used eight of them, over the two video discs. Both versions of "I Feel Fine" will be on the new releases, on video disc 2 of Beatles 1+ is the clip showing The Beatles eating fish and chips during their lunch break. Here I wrote: "No obvious choice. One thing to consider is to make use of the old US Beatles cartoons. That's how bootleg DVD video makers have solved this in the past, but given Universal Music's resources, they could also create a new video". 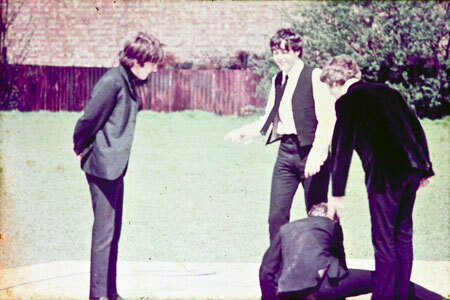 And create a new video they did, using scenes from "The Beatles at Shea Stadium", which is what I suggested for "A Hard Day's Night" (see above). Their description: A brand new clip edited from material filmed at the Shea Stadium concert in New York City on 15 August 1965, during which the band performed twelve songs, but "Eight Days A Week" was not among them. The clip says so much about the band’s frenetic lifestyle in 1965, at the height of Beatlemania. And they did: Filmed at Twickenham Film Studios on 23 November 1965. The Beatles' YouTube account actually published the full "Ticket To Ride" promo back in April 2015, but it is gone again now. And they did. Their description: The less frequently seen clip of those filmed at Twickenham Film Studios on 23 November 1965. I wrote: "There are two performances they could use footage from: Blackpool and Ed Sullivan. No Beatles Greatest Hits video compilation is complete without "Yesterday"." They went for the latter of my suggestions: Paul performing on "The Ed Sullivan Show", videotaped in New York City on 14 August 1965 and broadcast the following month, the day before the single was released in America. Again my suggestion was simply "Intertel". And they did: Three versions of this clip were filmed at Twickenham Film Studios on 23 November 1965. This is version 2, in which all of the group are wearing polo neck sweaters, except for Paul, who wears a black shirt. 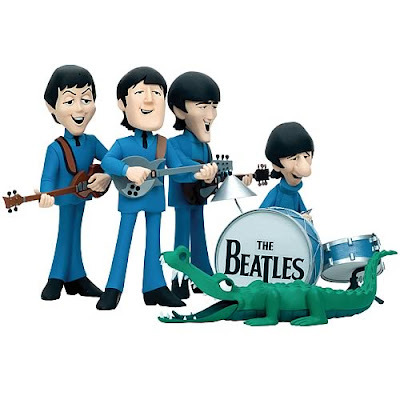 For the second video disc on the Beatles 1+ collection, they included one of the other two versions from the same day, with the group wearing their Shea Stadium jackets with the "Nehru" collars. So that leaves the third "Day Tripper" Intertel promo unused. But they also included a version from the TV special "The Music Of Lennon & McCartney" which was first broadcast in mid-December 1965. And they did. There were three versions of the "We Can Work It Out" video filmed at Twickenham Film Studios on 23 November 1965. 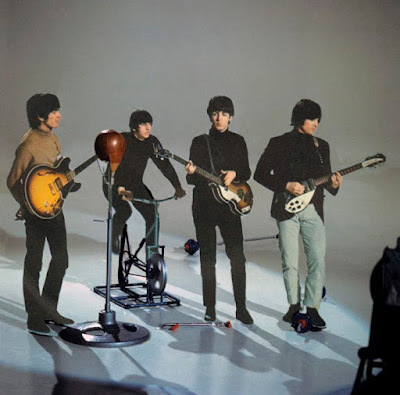 On the first video disc, they included version 2 in which all four Beatles are wearing black polo neck sweaters. Another version is included on the second video disc for Beatles 1+, The Beatles wearing the Shea Stadium jackets. Which leaves the third Intertel "We Can Work It Out" unused. I suggested: "As we saw in 'Anthology', there's a gorgeous video for this, made in the gardens of Chiswick. But they also have several Intertel promos filmed in a studio, so again a choice has to be made. And again, other versions can be bonus material". They seem to have followed my suggestions, on video disc 1 is the film I mentioned first, filmed in 35mm, and in colour, in Chiswick Park, West London, by director Michael Lindsay-Hogg. On video disc 2 of Beatles 1+, they used the colour studio version which was filmed with Ringo's introduction for The Ed Sullivan Show. A couple of black and white versions of "Paperback Writer" shot in Abbey Road's Studio One went unused. And they have followed my suggestions. For "Yellow Submarine", there's a newly created clip from original "Yellow Submarine" footage, whereas "Eleanor Rigby" is taken directly from the "Yellow Submarine" movie. I wrote: "There's only one music video for this one, and a great one it is, too". A look at "Penny Lane" before and after colour corrections. And of course they used it, that one was in the cards. A ground-breaking clip by Swedish director Peter Goldmann that captures The Beatles in Stratford, London, and at Knole Park in Kent, with additional material shot in Liverpool. Here I wrote: "They have to go for the "Our World" clip, colourised or in black and white, either way is good". 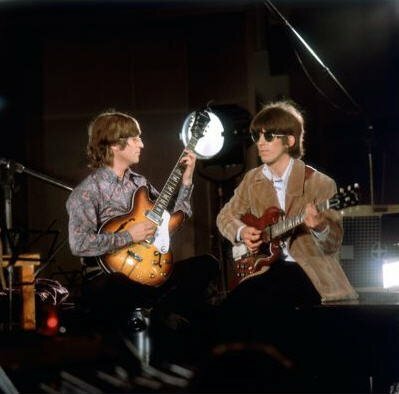 Another no-brainer, filmed in Studio One at Abbey Road, on 25 June 1967, and beamed around the globe as a part of the TV programme "Our World". This colourised version was created for "The Beatles Anthology" TV programme in 1995. When you see clips from this film as part of the promo for the new video collections, it doesn't look as good as the others. I don't know if they've transferred the original video tape again in 4k and colourised it over again, but it doesn't look like they have. For this video, I wrote: "Three videos were made, all at the Savile Theatre. Of these, I prefer the one they made from outtakes, and it's also the one that's closest to modern music videos. In 'Anthology', they intercut footage from all three films, here they should use no. 3 and have no. 1 and 2 as bonus material". From looking at the descriptions for the new releases, it looks like they've gone for no. 1 on the first video disc, and nos 2 & 3 on the second. But they've included them all, so I'm good. Unless of course, they've tampered with no. 3 and given it new edits. I wrote: "There's two variations of this promo clip, both edited from footage of the Beatles recording "Hey Bulldog". Go figure"! Their description of the clip they used: Just prior to leaving for India, The Beatles met up in Studio Three at Abbey Road, on 11 February 1968. They were filmed while recording "Hey Bulldog". So that seems good, I just hope they didn't do what they did on 'Anthology', which mixed in unrelated footage. Another no-brainer, I wrote: "Michael Lindsay-Hogg recorded several takes of this at Twickenham. Use one of those". And here they have been very nice to us. One of the four takes has been used on video disc 1, and two of the other takes mixed together on video disc 2 of Beatles 1+. Which of course leaves us with the fourth take unused and we still don't have the unaltered other two takes, just a mix of them. But hey, this is a commercial product! Their descriptions: Filmed at Twickenham Film Studios on 4 September, for broadcast on David Frost’s TV show, "Frost On Sunday". The introduction by David Frost is different from that on disc 2. On said disc: This is an edit of the two other takes filmed on 4 September 1968 for the "Frost On Sunday" TV show. This has a different David Frost intro to the clip on disc 1. For this track, I wrote "I would have gone for the studio version clip they made for 'Let It Be...Naked'". Again, they have bested me by including both the clip I suggested (on video disc 2), and also recreated the original 1969 promo film from the original footage in better quality (on video disc 1). Descriptions: The promo clip made available at the time of the original release of the single featured performances from the Apple rooftop synched to the record. This new clip has been rebuilt to replicate the original but with improved picture quality. And on video disc 2: This clip was assembled in 2003 to support the release of the album "Let It Be…Naked" and utilises studio footage from the famous "Get Back"/"Let It Be" sessions. Here I wrote: "Another one which has several edits, use the one with colour footage throughout. Again, the Anthology used a combination of several versions. Stick with one". And it seems they may have followed my suggestion. Their description: This original promo clip features outtakes from the "Let It Be" movie, with other private footage shot in Amsterdam, London, Paris and Vienna. We'll just have to wait and see if it's the one with the most colour footage throughout. No alternate versions made available. A true no-brainer if there ever was one, "No problem here, the one and only 'Something' promo clip", I suggested. Their description: The video features George and Pattie, John and Yoko, Paul and Linda, and Ringo and Maureen. and was filmed at locations in Berkshire, Surrey, and the Mull of Kintyre. From looking at the video clip of restoring this film, it does look as they went back to the original promo again, discarding previously restored versions. So it's probably one of the new 4k transfers. Here I wrote: "They made a flash animated music video for this when "1" was new, use that. Fortunately, flash allows for limitless upscaling without the loss of resolution, so go find the flash source file". And they seemed to have followed suit, their description is: The clip was created in 2000 by Melon Dezign for the launch of thebeatles.com and the original Beatles 1 album. And this they have indeed done, although the first one has been recreated, using the same footage and edits, but with upgraded source material. Their descriptions: For "Let It Be", a 1970 promo clip was made available to support the release of the single and it was different to the one featured in the "Let It Be" movie; this clip has been rebuilt from the original footage. "The Long And Winding Road" is taken straight from the "Let It Be" movie. And that completes the Beatles 1 video disc. But of course, I also suggested to include some bonus material. 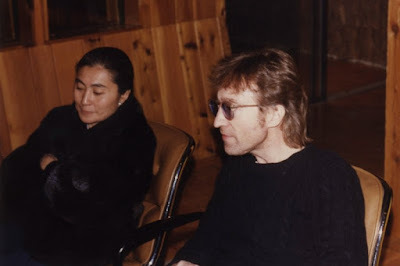 I wrote: "Now is the chance to unearth some of the Lennon B-sides of the singles, and Yoko Ono will be aware that in the later days, Paul usually had the A-sides and Lennon the B-sides. Arguably, the B-sides sold the exact same number of singles as the A-sides, so they should also be treated as number ones. And they should be placed chronologically alongside their A-sides". "So these should include: "This Boy", "Rain", "Strawberry Fields Forever", "I Am The Walrus", "Revolution" and "Don't Let Me Down". Possibly also "For You Blue", using footage from the Get Back film. Olivia and Dhani Harrison will want that". Of these, Apple Corps Ltd and Universal Music Group has chosen to include four of the seven I suggested. "Rain" was included thusly: Two versions, the colour film from Chiswick House, West London, on 20 May 1966 was used as the first version. A second version was edited together from several takes of "Rain" videotaped at Abbey Road on 19 May 1966. 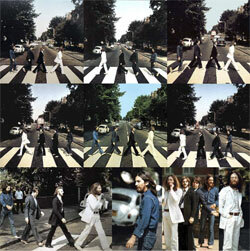 Which leaves the full Abbey Road Studio One versions unreleased. A sample of "Strawberry Fields Forever". "Strawberry Fields Forever": Directed by Peter Goldmann and with newly restored footage, this was filmed at Knole Park, Kent on 30 and 31 January 1967. "Revolution": One of two versions, this was shot the same day as "Hey Jude". John’s lead vocal is completely live, as are most of Paul and George’s backing vocals. The instrumentation, including Nicky Hopkins’ electric piano, is from the master tape. Which of course, leaves the other version unreleased. "Don't Let Me Down": This was the B-side of "Get Back" and this clip is a composite of two live performances from the Apple rooftop in 1969. It was made available to support the release of "Let It Be…Naked" in 2003. It has also previously been available to purchase as a download on iTunes. A 1969 promo film to accompany this song was also assembled from studio and rooftop footage. Like "Get Back" it could have been recreated for this collection but wasn't. Then I wrote: "In the same way, we have a few more one-offs which should make the DVD. The 1976 music video for "Back In The USSR" was made to promote the "Rock'n'Roll Music" compilation album, but it's not necessary to include it here. The same goes for the 1983 music video for "Please Please Me", both of these are largely forgettable". However, they didn't take this advice: "And the BBC 1994 "Baby It's You" alongside the 2013 "Words Of Love" videos are also difficult to include on a "1" compilation. Same thing with the "Within You Without You"/"Tomorrow Never Knows" video, best used on a "Love" DVD". They included all three. But I'm not sorry they did. Description for "Baby It's You": One of two clips used to promote the single taken from the 1995 "Live At The BBC" album. The clip is enhanced by the inclusion of unique colour footage of The Beatles filmed outside the BBC’s Paris Studio on Lower Regent Street, London. Of course, that colour footage was also included in one of the 1995 clips. This leaves the other 1995-video unused. The 2013 video for "Words Of Love". When "On Air – Live At The BBC Volume 2" was released in 2013, it included "Words Of Love", a Buddy Holly composition that the band recorded for radio. This new clip is a mix of existing footage and innovative animation. Description for "Within You Without You"/"Tomorrow Never Knows": The merging of these two tracks, one from "Sgt Pepper’s Lonely Hearts Club Band", the other from "Revolver", was created for "The Beatles Love" show by Cirque du Soleil, which opened in June 2006 in Las Vegas. This video was created to promote the "Love" album released later that year. Here's one advice they followed: "However, 1999's "Hey Bulldog" is a great video with the Beatles recording the song in the studio. Much of the same footage was used for the "Lady Madonna" promo, so "Hey Bulldog" is another track best kept outside the play list but should be a (hidden) bonus". "Hey Bulldog" is indeed included on video disc 2. Previously, it has also been available to purchase as a download on iTunes. I never anticipated that they would produce a whole second disc, so they had room to include more bonus material than what I initially suggested. I also wrote: "Another bonus track could be the "Help" promo that was used in the movie, but without the dart throwing". The promo in question, by the way, is slightly different from the one used in the film, but is not listed in the contents of the new releases and remains unreleased, unless it's an unlisted "easter egg" on one of the video discs. Here are two other suggestions I made, both not adressed by the new release: "One video that's already linked to "1" is the "I Feel Fine" flash animated video. 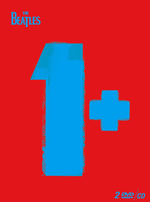 It was made to promote the original "1" album release, and was used on The Beatles' web site. So it could either go in to the play list instead of the Intertel promo, or as a bonus feature". This one was not included. "Back in 2003, Apple made a music video for "Two Of Us", and I'd hate to have it missing from the collection. However, it wasn't a single so it could be a hidden track, accessible from the menu but not part of the play list". Again, not included - unless it's a hidden track like I suggested. "Twist and Shout" from the Granada Television programme "Scene At 6.30", which was videotaped on 14 August 1963. "Please Please Me" - a live performance videotaped on 9 February for "The Ed Sullivan Show", which was screened on 23 February 1964. "A Day In The Life" - a terrible oversight by me, I should have suggested this, as it is an original 1967 promo film. Filmed in Studio One at Abbey Road on 10 February 1967, this includes classical musicians, who were asked to wear evening dress, fake noses and funny hats for the recording session. The Beatles' YouTube account actually published the full "A Day In The Life" promo back in February 2015, but it was removed again after a few days. 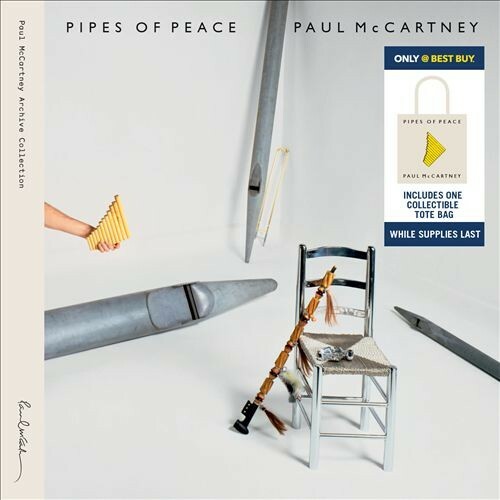 "Free As A Bird" - I didn't suggest this and the next one, since they were both included on the Beatles "Anthology" DVD discs, so I didn't think they needed a re-release. Still, it's good to have them in this context - not to mention new audio mixes by Jeff Lynne. The 1995 video is a work of art by director Joe Pytka, who used the concept of a bird’s-eye view to pay homage to many Beatles songs and images. "Real Love" - This video directed by Geoff Wonfor and ex-10cc and leading pop promo-maker Kevin Godley, this video was made in 1996 to support the release of the single. Two versions were made, so we're probably still missing one - unless there's one on "Anthology" and another one here. Of course, I'm not implying that the powers that be read my blog post, but it's nice to see that quite a number of my expectations have been met. There is going to be a lot of hoopla surrounding these new releases, in the shape of printed ads in music papers and magazines, as well as radio and TV commercials. ITV in Great Britain is going to screen a 2 hour long programme called "Nation’s Favourite Beatles", where the favourite Beatles song of Great Britain will be selected by viewer votes. Of course, social media will also be utilized, we've already witnessed a bit of that on YouTube, Facebook, Instagram and Twitter. It also looks like Apple Corps Ltd is trying to get rid of unlawful former uploads of these videos on YouTube by various users. .
A one hour blu-ray presentation promo disc has been produced for insiders and partners, and a 15 minute film about the project itself has also been made. And as George Harrison would have said, somewhere down the line, there's going to be a t-shirt. What if the Beatles never broke up?